Earn 3 Creds Per $ Spent at Catch ? Get this deal now at Catch Or Join for free to earn eligible Creds! Club Catch Weekend Special! 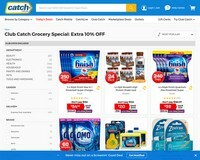 Extra 10% OFF Hottest Grocery Deals!